Miami Corporate Services Attorneys | Mark E. Fried, P.A. As a business owner, you face many important decisions. The experienced Miami corporate services attorneys at Mark E. Fried, P.A. can help you protect your interests and maximize the profitability of your business every step of the way, from the formation of the business to its expansion. One of the most important decisions you will make when you form your business is the selection of the business structure. You may choose to structure the business as a sole proprietorship, limited liability company, S corporation or C corporation. Each of these structures offers different advantages and disadvantages, so it’s important to compare your options carefully before making a choice. 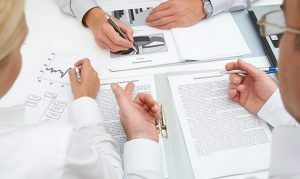 Qualified corporate services attorneys can help you review each structure and determine which is best for your needs. Your attorney can also help you establish the business successfully while complying with all relevant regulations. All business agreements are important, so you need to make sure that every contract you sign protects your rights and serves your best interests. The attorneys at Mark E. Fried, P.A. can help you draft new contracts, review contracts from other parties and negotiate terms successfully. This firm handles all types of contracts, including employment agreements, partnership agreements, purchase orders, consulting agreements, invoices, service agreements and more. Businesses often need to purchase real estate to operate successfully. Because the purchase of business property can be complicated, consulting an experienced attorney is recommended. The right attorney can help you review the terms of the purchase, make sure that the agreement serves your interests and execute the transaction quickly and effectively. Mark E. Fried, P.A. can also help you if you decide to sell real estate your business owns. With the help of the experienced attorneys at this firm, you can be sure you are making the best profit on the sale of your real estate. Mark E. Fried, P.A. has 30 years of experience as a Miami attorney providing corporate services. If you are planning to form a new business, or if you need help with any legal issue related to the operation of an existing business, please contact (305) 371-7079 today to make an appointment or to learn more.